Lexington Clinic — OT4KIDS INC.
Our 9,000+ square foot clinic was created for holistic treatment of the whole child, offering an adapted waiting room, multi-sensory room, swing room, game room, indoor gym, outdoor area, garden, kitchen, functional training bathrooms, and craft spaces -- all designed to meet the individual needs and increase the functional performance of our clients. With two large fish tanks, multiple seating areas, and a large projector screen, our waiting room is designed to meet sensory needs in a tailored environment before the start of therapy sessions. Our sensory room includes modified colored lighting, various swings, a tent, water bed, and various sound features to adapt sight, smell, feel, vestibular input, deep pressure, and proprioceptive input for sensitive sensory needs. The indoor gym is our largest, most dynamic environment with a wide variety of playground equipment, including: ramps, steps, scooter boards, bikes, a zip line, ball pit, balance beams, swings, monkey bars, therapy balls, and much more! 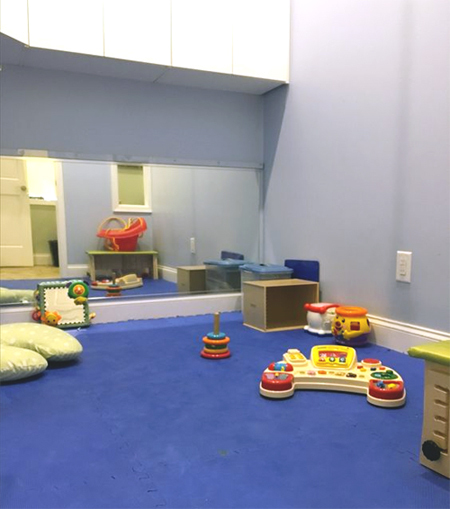 This space allows plenty of room to work on gross motor development, group activities, and provides several dynamic surfaces to use during treatment. Our expansive outdoor area is a versatile space with jungle gyms, a vegetable garden for exposure to fresh foods, outside games, a large trampoline, and therapy animals including dogs, a rabbit, and horses. 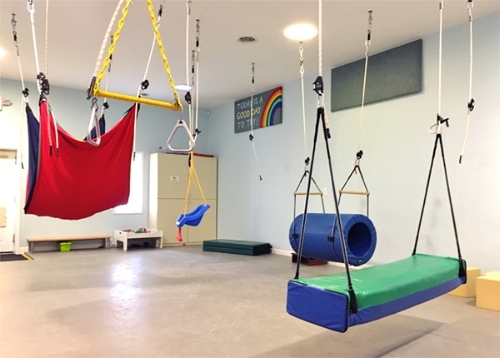 Our expansive swing room has multi-surfaces and swings that can be set up simultaneously for interactive vestibular input between children. Multiple bathroom stations - including a standard tub and shower stall - work on dressing, bathing, brushing teeth, toileting, hygiene, hair care, and nail care skills. Developmentally appropriate toys for 1 month - 18 months, including mirrors, swings, and padded floors. Our kitchen includes sinks, an oven, stove, refrigerator, microwave, toaster, blender, dishwasher and laundry facilities where we are able to address feeding/eating, oral motor, and activities of daily living skills. Our game room contains exercise and gym equipment, as well as gaming systems and a massage table. Our individual small rooms are used as evaluation spaces, or quiet areas for individual work. They provide an alternative space for kids with auditory sensory sensitivities, or difficulty with attention to tasks. They are also frequently used by our speech therapists for tabletop work. 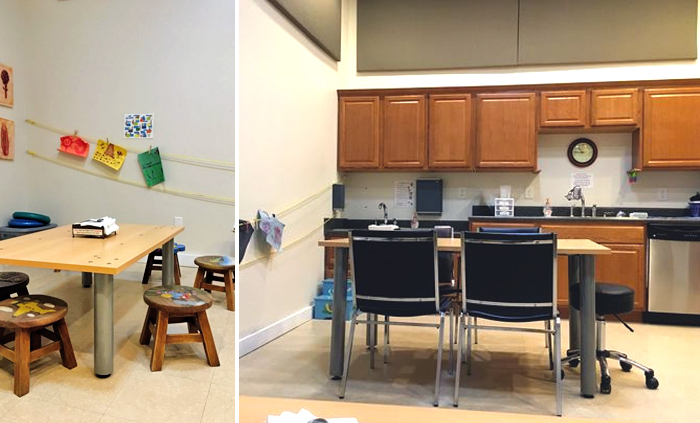 Our large craft room includes multiple table set-ups, spaces for alternative writing options, and quiet spaces for individual work -- great for hand strengthening, handwriting, drawing, crafts, social skills, visual motor, visual perceptual tasks, and much more!